OAK BROOK, IL - February 11, 2019 - Millennium Trust Company, LLC (“Millennium Trust”), a leading provider of retirement and institutional custody services to advisors, financial institutions, businesses and individuals, wrapped up a successful year of transactions, expanded offerings and overall growth. This year, Millennium Trust continued on the growth trajectory that has been established for years, and ended the year with $26.6 Billion assets under custody in almost 1.2 Million accounts – the latter of which is up 50 percent from 2017. In 2018 Millennium Trust was recognized for this sustained growth with awards like Crain’s Chicago Business Fast 50 and Inc. 5000. The firm strives to continue to expand its product offerings, while also continuing to cultivate a strong culture among its employees. Retirement Services focused on expanding service offerings to position itself as a leading service provider in the retirement industry, working to promote retirement readiness for all Americans. One significant focus was Workplace Savings Solutions, a product that will provide small- and mid-sized businesses and their employees access to easy, affordable retirement saving options. These retirement saving options, like SIMPLE IRAs, SEP IRAs and Payroll Deducted IRAs, will give small- and mid-sized employers the power to choose and the flexibility they need. Also in 2018, Millennium Trust acquired a portfolio of approximately 160,000 individual retirement accounts from The Bancorp Bank (Bancorp). This acquisition reinforced Millennium Trust’s position as the leading service provider of automatic rollover solutions, helping to reconnect missing participants with their retirement savings. Millennium Trust also continued to bolster its position as a leader in the custody of alternative assets in self-directed IRAs. The firm custodies more than 15,000 unique alternative assets, including real estate, private equity, hedge funds and more. 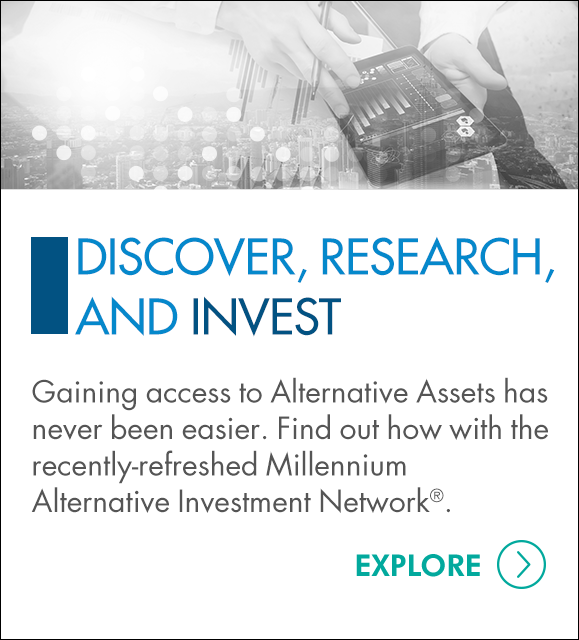 The firm also enhanced the Millennium Alternative Investment Network® (MAIN®), a network that increases access to alternative investment platforms, in 2018 with new educational tools and resources, as well as new investment platforms, including Gold Bullion International, KBS and CrowdStreet. Institutional Custody Services closed out the fourth quarter with more than $13.8 Billion in fund assets under custody in more than 450 private and public funds. The team demonstrated its commitment to building strong relationships and better serving clients throughout the year through the re-alignment of the Sales team and expanded offerings. The accomplishments in 2018 illustrate Millennium Trust's strong commitment to being an ally in its clients’ journey to retirement readiness. As Millennium Trust looks to 2019, it strives to continue to offer exceptional service, trusted expertise and secure and easy access to custody solutions. Millennium Trust Company is a trusted leader in specialized retirement and institutional custody services, empowering clients with unmatched service, access to a wide range of custody solutions and expertise they can count on. Whether it's the custody of alternative assets, investment accounts or retirement funds, Millennium Trust is uniquely qualified to support our clients' success. Millennium Trust Company performs the duties of a directed custodian, and as such does not provide due diligence to third parties on prospective investments, platforms, sponsors or service providers and does not sell investments or provide investment, legal, or tax advice. For more information follow us on Twitter and LinkedIn.